New Village Arts’ HALL PASS is an exciting, immersive, site-specific performance event created exclusively for high school students. 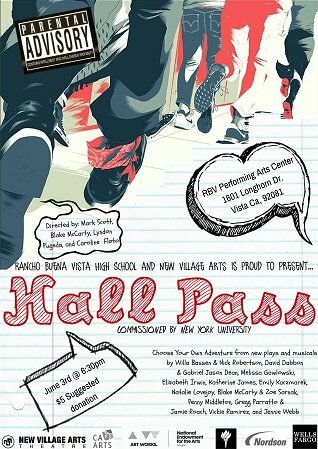 HALL PASS will transform Rancho Buena Vista High School into a theatrical playground as students perform new, short works offering insight and perspective on the lives of teenagers in the twenty-first century. This “choose-your-own-adventure” night of theatre features new plays and musicals by Willa Bassen & Nick Robertson, David Dabbon & Gabriel Jason Dean, Melissa Gawlowski, Elizabeth Irwin, Katherine James, Emily Kaczmarek, Natalie Lovejoy, Blake McCarty & Zoe Sarnak, Penny Middleton, Gregg Parratto & Jamie Roach, Vickie Ramirez, and Jennie Webb. Audience members will receive a guide and be able to choose which theatrical path they will take for the night. 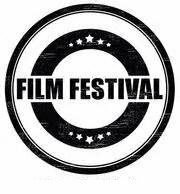 HALL PASS was created by Blake McCarty with a commission from New York University. The short plays are directed by Mr. McCarty, Mark Scott, and Caroline Floto with musical direction by Lyndon Pugeda. Sponsors of HALL PASS include the California Arts Council’s Artists in Schools program, Wells Fargo Bank and The Nordson Foundation. Mark Scott, the drama teacher at Rancho Buena Vista High School working on the show, is one of the most well-respected theatre teachers in the county (if not state) and his daughter will be performing in the show — which will mark her very last performance at the school. 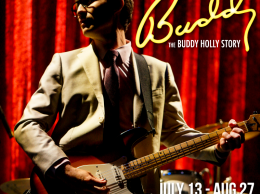 Please Note: the play contains intelligent and well-chosen profanity and some intense situations – much like high school.